Primary renal carcinoid is extremely rare and there are few reports on the natural history of the disease. A 68-year-old male with a right renal mass who lost to follow-up for ten years has been presented. His only complaint was a mild flank pain. Upon admission to the hospital for his renal mass, he underwent a right radical nephrectomy and pathological examination revealed the diagnosis of primary renal carcinoid. In light of the presented case, primary renal carcinoma may have a prolonged natural history with no distant metastasis and any change in the quality of life of the patient. Although common in respiratory and gastrointestinal organs, carcinoid is rarely encountered in the urogenital system. Primary renal carcinoid is especially rare with only 32 cases reported in the English literature, as of yet . Mean follow-up for carcinoid tumor has been reported to be 31.6 months, the longest being eight years following surgery [2, 3]. Clinical and histological behavior of the disease and survival remain to be an enigma due to its rarity. In the present report, a case with primary renal carcinoid who declined any intervention or follow-up for ten years was presented. A 68-year-old male was admitted with mild right-flank pain and chronic constipation in July 1999. 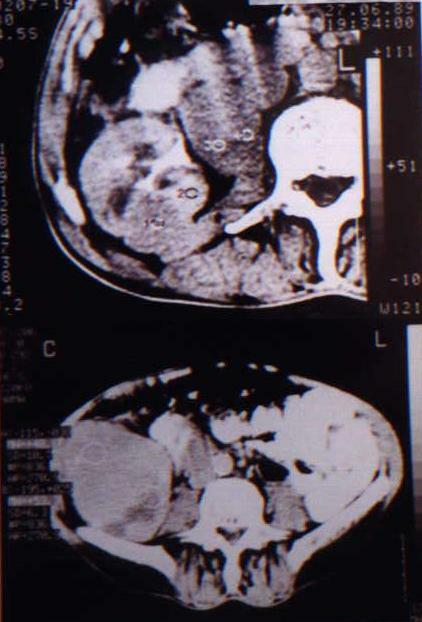 His past medical history revealed a diagnosis of a right renal mass posterior to inferior vena cava in addition to a single lymph node 65 × 43 × 34 mm and 22 × 12 mm in diameters, respectively on computerized tomography (CT) in 1989 (Figure 1, upper). He declined surgery and lost to follow-up for ten years. Computerized tomographic scans showing the right renal mass and lymphadenopathies in 1989 (upper) and in 1999 (lower). Physical examination revealed a palpable right flank mass. Computerized tomography showed two distinct masses with solid and cystic components and 108 × 94 × 72 mm and 110 × 90 × 75 mm diameters in the upper and lower poles of the right kidney, respectively. There was also evidence of invasion of right renal vein and inferior vena cava by the mass, and multiple paraaortic and precaval lymphadenopathies (Figure 1, lower). There was no other organ tumors and his metastatic workup was negative, as well. A right radical nephrectomy was performed with excision of the lymph nodes and removal of the segment of vena cava invaded by the tumor. Histopathologically, tumor cells formed ribbons and trabeculae and necrotic foci were seen on hematoxylin eosin staining (Figure 2, right). Nuclei of the tumor cells were pleomorphic and showed mitotic activity. The preliminary diagnosis was atypical carcinoid of the kidney. Immunohistochemical examination using chromogranine antibody and a streptavidin-biotin technique (Dako Chemicals, London) revealed positive staining tumor cells (Figure 2, left). 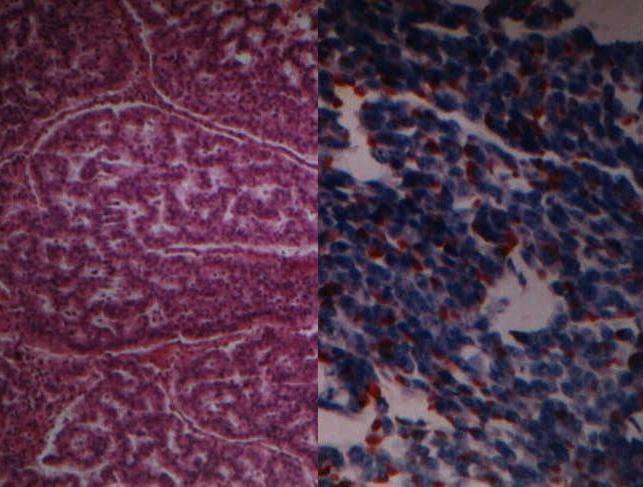 Immunohistochemical staining for somatostatin, vasoactive intestinal polypeptide and gastrin were all negative. Postoperative colonography, colonoscopy and endoscopy revealed no abnormality pertaining to gastrointestinal source of the tumor. Computerized tomography scans obtained at 6 months from his surgery showed three enlarged lymph nodes, possibly indicating a local recurrence. The patient refused any further treatment and was agreed on follow-up examinations with CT. He is still alive without any significant complaint. Histopathological examination shows ribbons, trabeculae formation and mitotic activity (Hematoxylin-eosin, ×40, right) and positive staining with chromogranine antibody of tumor cells (×200, left). Although common in respiratory and gastrointestinal organs, carcinoid is uncommon in the urogenital system. Primary renal carcinoid is especially rare; there are only 32 cases reported in the English literature . Carcinoids usually present with their neuroendocrine secretory functions; however, only two cases of Carcinoid syndrome and one Cushing's syndrome were reported with primary renal carcinoids [1, 2]. The 5-year-survival rates in patients with carcinoid tumors are 65% for localized and 36% for metastatic tumors . In the presented case the patient had the diagnosis of right renal mass without any medical intervention or follow-up for 10 years. The mass nearly doubled in size, spreaded intrarenally, and invaded the precaval and paraaortic lymph nodes without any distant metastases. There were no clinical symptoms other than mild flank pain. His constipation was considered unrelated to the primary disease since plasma serotonin, vasointestinal polypeptide and urinary 5-hydroxyindoleacetic acid levels were all within normal limits. To our knowledge, this is the first case on the natural history of primary renal carcinoid in the English literature that radiological and clinical behavior could be assessed for 10 years without any intervention. We have shown that, primary carcinoid of the kidney may stay localized and follow a silent course without any distant metastasis, may be devoid of any paraneoplastic syndromes and does not have any impact on the quality of life of the patient, as long as 10 years. We would like to thank Associate Prof. Dr. Mevlana Derya Balbay for reviewing the manuscript and our patient for giving written consent for publication of their details.